The Lake County, Illinois CVB requested TwoSix Digital help with their summer tourism promotion with the goals of promoting Six Flags Great America theme park and KeyLime Cove indoor water park, get consumers to opt-in to the Lake County e-newsletter while also driving traffic back to the CVB’s website. TwoSix Digital designed a giveaway within the Woobox platform that allowed people to enter while also providing an opt-in button for those interested in the Lake County e-newsletter. 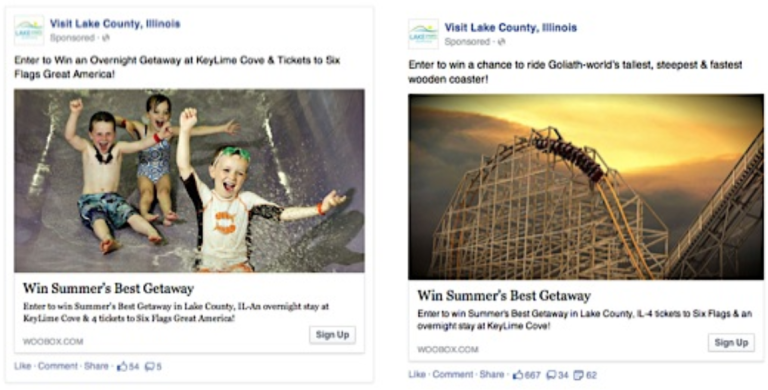 To bolster entries and awareness, TwoSix Digital set up and ran a highly-targeted ad campaign using a number of techniques and tools, including Lookalike audiences of the Visit Lake County Facebook page, previous year’s entrants and e-newsletter list. Visitors to key blog posts were also retargeted with ads through a tracking pixel and Lookalike audience. The Visit Lake County summer tourism promotion campaign is a great example of TwoSix Digital’s ability to strategically target the right people through its ads with the right messaging to drive results. Of the 6,932 entries 84% opted-in for the e-newsletter. The “Deals and Specials” landing page entrants were directed to after entering the promotion obtained more than 1,800 sessions as a direct result of promotion. The campaign social media ads click-through rate averaged 3.5% which, according to a report for Q2 2015, is more than 11 times the global average of .3%. Furthermore, by mapping the zip codes of entrants the map to the right was created, clearly showing a strong presence of entries within the Indiana, Illinois, Ohio, Wisconsin and Michigan states we set out to target.